The Premium Tequila in the portfolio of G&G International Commerce is the Tequila El Conde Azul, loosely translated: The Blue Nobleman. The Agaves being used to produce this Tequila are cultivated in Los Altos van Jalisco, in Mexico. There are three types of Tequila's (Blanco, Reposado en Añejo), all with an alcoholpercentage of 40% and a volume of 100ml and 700ml. The next paragraphs highlight the characteristics per type. A final word is spend on the distillery Vinos y Licores Azteca of this exclusive and authentic Tequila. Is a white Tequila bottled after the distillation process. In this Tequila traces of herbs and berries from the region are retrieved. Its flavour is soft and is very suited as aperitif. Is a light golden colored Tequila. The Reposado has aged 8 months in white oak whisky barrels which explains the light golden color. Due to the aging process in the barrels the Tequila obtains a wood taste and some light touches of caramel. El Reposado can be drunk as aperitive, but is also known for its digestive properties and is very suited to drink between courses of a menu. Is a light brown Tequila aged 3 years in white oak barrels. El Añejo is extremely suited as digestive accompanied by a good sigar or dark chocolate. Carmen Lucia Barajas Cardenas, also known as "Melly", founded Vinos y Licores Azteca SA de CV 1999. Melly landed as a woman in a world of macho men of Guadalajara and she had to work twice as hard to become sucessful. Her hard labour and her continuously drive to innovation were rewarded. 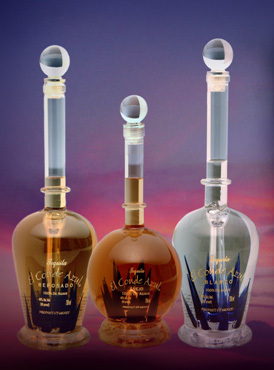 The premium Tequila of Vinos y Licores Azteca is El Conde Azul. This is a beautiful and elegant Tequila produced by a masterly combination of Mexican innovation and Italian fine glassware. The bottles of El Conde Azul are all handmade bottles of Italian origin. The bottles are manufactured of 100% crystal. The blue 'spikes' in the bottle symbolize the pencas (leaves) of the Agave plant. These pencas are put manually into the bottle. After this the bottle is sealed on the bottom. To be sure that there is no leak, the bottles will be filled with liquid and stored for 10 days. During this period the bottles will be checked regularly to make sure there are no leaks. If, after 10 days, no leaks were found, the bottle will be foreseen from its label. This label is a 24 carat golden label and will be encarved in the bottle.